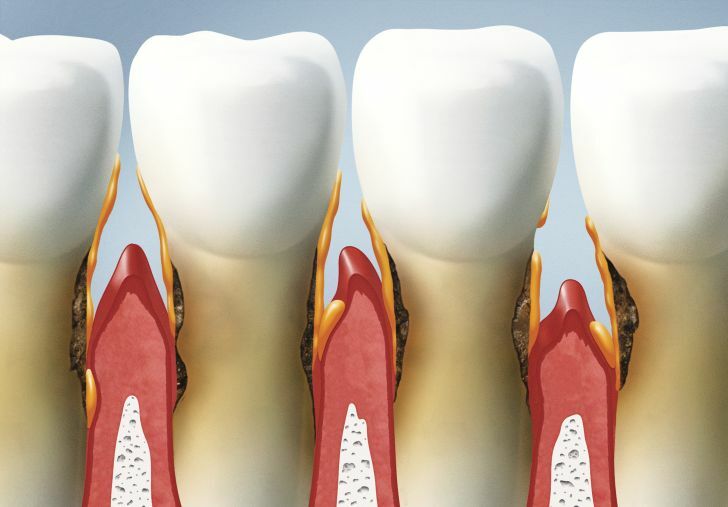 Periodontal disease affects nearly half of all Americans. While the early stages of gum disease (gingivitis) can be difficult to detect because there are not many pronounced symptoms, the disease can easily progress if proper oral hygiene care is not followed. If you think that you may have gum disease, it is critical to get treatment as soon as possible. Early periodontal care is the only way to prevent chronic, irreversible periodontitis. At Skutak Dental, we offer judgment-free care and effective treatments for gum disease with a focus on prevention and early detection. Gingivitis refers to an infection and inflammation of the gums. This is caused by the buildup of plaque and tartar on or below the gumline. Plaque is a sticky substance composed of oral bacteria. Without proper brushing and flossing your teeth or having routine cleanings and oral exams, this plaque can harden into a calcified substance called “tartar”. In turn, this causes an infection of the gums. The gums will become tender and inflamed as they attempt to fight back against the infection. If you do not seek treatment, periodontal disease can cause issues like the loosening and loss of your teeth, oral abscesses and infections, and even a higher risk of heart disease and stroke. There are many different treatments available for periodontal disease. One of the most common is a “deep cleaning”, also known as “scaling and root planing”. During this treatment, the hygienst will use dental instruments to clean below the gumline to remove bacteria from the root surface to prevent further infection. Antibiotics may also be placed below the gumline to help fight infections. Advanced cases of periodontal disease are not reversible. To keep the infection from progressing any further and to maintain a reasonable level of oral health, patients who suffer from advanced periodontal disease should be seen for regular 3-month periodontal cleanings. Since the disease is irreversible, it is very important to seek help for periodontal disease as soon as possible. You can contact us by phone at (715) 355-4433, or come by our office at 700 Eagle Nest Boulevard, Suite E, Rothschild, WI 54474 to get started with your personalized periodontal care plan.